From restaurants and bars to games and sight-seeing, there are plenty of things to do in Bricktown. It's a favorite for visitors and locals alike, and a worthwhile stop while exploring all the top attractions elsewhere in OKC. The canal is the center piece of the popular Bricktown entertainment district in Oklahoma City. 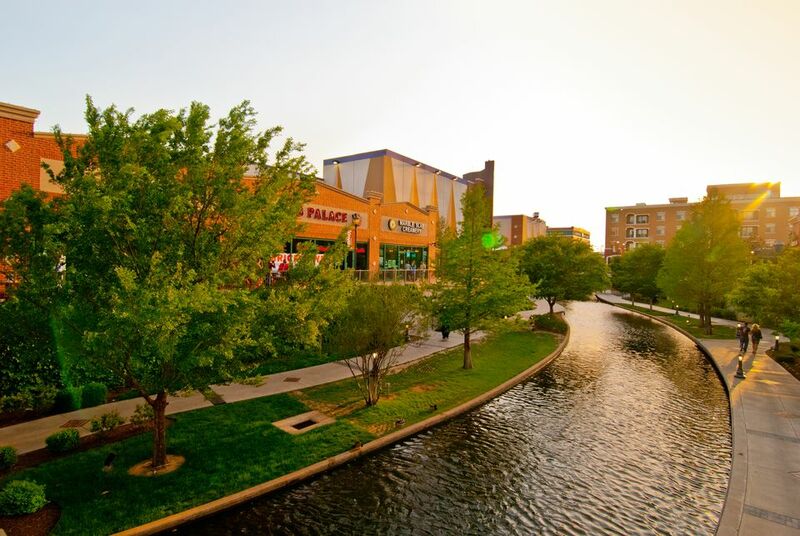 Take a leisurely stroll alongside it and check out all that Bricktown has to offer. Even better, buy a ticket for a water taxi ride. They're covered in the summer, making it not too hot along the water, and the winter season brings the beautiful holiday lights. The selection of restaurants in Bricktown is pretty good for such a fairly small area overall, and there's likely something to satisfy any taste, from the fine dining of Mickey Mantle's Steakhouse to the relaxed experience at Bricktown Brewery or Toby Keith's. After dinner, visit the Bricktown Candy Co. along the canal or Pinkitzel at the entrance to Bricktown for a unique treat. Watch the Dodgers at "The Brick"
Don't miss an opportunity to see the Oklahoma City Dodgers, the metro's AAA affiliate of the Los Angeles Dodgers, play at the beautiful Bricktown Ballpark. The park has plenty of giveaways and promotions throughout the season, but even without them, it's a great experience. You'll be able to go see them play anytime between April and September. The nightlife in Bricktown is pretty exciting and holds a variety of options. For a club atmosphere, check out Club One15. Other hot spots include Coyote Ugly, Whiskey Chick's, and Cosmopolitan. Several restaurants in the area, including Toby Keith's, occasionally have live music as well. Finally, check out the UCO School of Rock and The Criterion. Whenever metro residents talk about improvements to the Bricktown area, one of the first topics to enter the discussion is retail. There aren't a lot of shopping establishments in Bricktown right now, but there are a couple. The Painted Door has unique specialty gifts, the Red Dirt Emporium has Oklahoma collectibles and, of course, Bass Pro Shops is a huge outdoors sports complex. For some tasty treats, stop by the Jumping Jackalope, across from Harkins Theater and the Ballpark, for beef, venison, and buffalo jerky, or an assortment of locally made fudge. One of the top draws in Bricktown is the Harkins Movie Theatre, and it's among the best in OKC. There are 16 screens, and all are nice, equipped with digital sound and stadium seating. If you are bringing the kids, Harkins offers a lobby PlayCenter where the kids (ages 3 through 8) will be supervised by professional staffers while playing games or watching a film, while the parents step away to catch their movie. Opened in 2015, Brickopolis not only features a great miniature golf course right on the canal but also video games, climbing wall, pizza buffet, and more. The view from the top floor laser tag arena gives a stellar view of all of downtown. It's perfect for an afternoon of fun for the whole family. If you fancy a game, why not go to a lane that actually is fancy? At HeyDay Lower Bricktown bowling goes chic with sumptuous leather couches, high-tech scoring, and lane-side service at each of the ten lanes. Specialty cocktails and 55 beers bottled and tap beers ensure the team will have fun no matter the final score. The venue also hosts regular weekly events like a Trivia Night. Taking a canal taxi is certainly fun, but it's not what one would typically term a romantic ride. For that, make your Bricktown experience a special one with a horse-drawn carriage ride along the streets of the district. The Clydesdale and Percheron horses pull elegant carriages, either for transportation or just a quiet tour. Arrangements can also be made to pick-up passengers at their hotel or at a restaurant at a pre-determined time. Bricktown has several very good hotels right in the middle of the action. The Hampton Inn & Suites offers views from the rooms overlooking the ballpark, while the Residence Inn provides direct access to fun water taxis directly below the property, and the trendy Aloft Hotel has a hip bar with ongoing events. For extended stays, there is a full-sized refrigerator, microwave, and stove in each room at the Homewood Suites, plus complimentary hot breakfast. There are two excellent golf courses only a few minutes drive from downtown Bricktown. At the Lincoln Park, you can test your skills by driving from 6600 yards off the black tournament tees on the Par 71 West course. The 18-hold East course is equally challenging. For a quick game, swing by the James E. Stewart Golf Course which has 9-holes, plus a quaint bar and restaurant to grab a bite after the last hole. This course is especially welcoming for weekend duffers or new players.